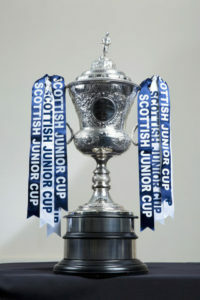 The draw for the first round of the Scottish Junior Cup will take place this evening at Hampden Park. A number of sides will receive first round byes to whittle down the entry list to 128 teams with the junior sides competing in the Senior Scottish Cup also joining at the second round. Last season Pollok received a bye in the first round and went on to draw Glentanar of Aberdeen in round two before being defeated after a hard fought replay against eventual finalists, Auchinleck. Pollok’s last success in the trophy came in 1997 but they have reached the final as recently as 2016, where they were unlucky to lose out on penalties to Beith Juniors.